Song of the Deep is an introspective little game from a blockbuster studio. Song of the Deep seems like a weird fit from every angle. It was developed by Insomniac, which I mostly associate nowadays with big-budget romps like Resistance and Sunset Overdrive. 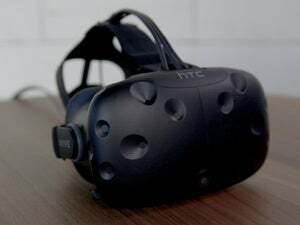 And it’s published by a subdivision of GameStop, a store I mostly imagine selling…well, big-budget romps like Resistance and Sunset Overdrive. And yet Song of the Deep ($15 on Steam) is a quiet, self-reflective, and occasionally gorgeous 2D adventure that doubles as a coming-of-age story for its young and resourceful protagonist. Strange bedfellows. Song of the Deep tells the story of Merryn, a girl brought up alongside the sea. Her father, a fisherman, tells her stories every night about what lies beneath the waves—huge cities, belonging to the underwater Merfolk and providing refuge against the ocean’s horrors. Merryn doesn’t believe him, of course. But when he disappears and doesn’t return to the house for days on end, she cobbles together a submarine out of spare parts and sets off in search of him. Told you she was resourceful. Lo and behold: The stories were true. There is quite a bit hidden beneath the waves. It’s Big Fish by way of the 2014 animated film Song of the Sea. Hell, if I didn’t know any better, I’d almost believe Song of the Deep is the official licensed game adaptation of Song of the Sea. There are a lot of broad strokes similarities, both narratively and aesthetically. 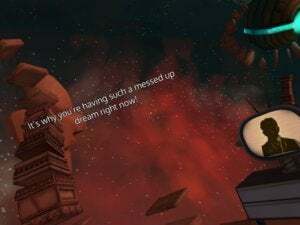 Insomniac’s story works though, simple as it is. 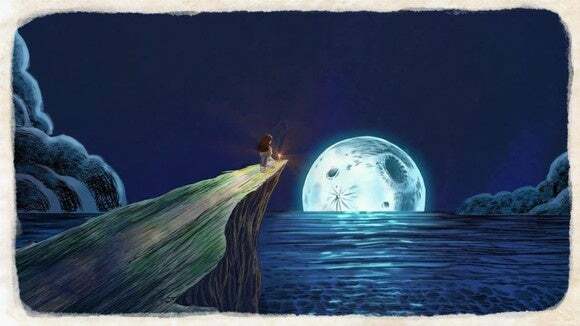 Related by way of a narrator, the game presents itself like a fairy tale world, imbuing the ocean depths with wonder—feelings shared by Merryn herself. With naught but the submarine on her back, Merryn sets out to comb the ocean for her father’s sunken fishing boat. And as these things go you’ll gradually upgrade that same submarine, unlocking parts of the map or new paths inside places you’ve already been. It’s a charming story glued onto the spline of a Metroidvania, the same lock-meets-key sort of game recently represented so well in Axiom Verge and Ori and the Blind Forest—except here there’s a submarine, which makes Insanely Twisted Shadow Planet or Aquaria a more appropriate analogue I suppose. 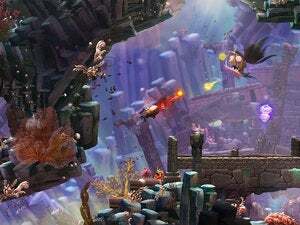 Insomniac’s dreamt up a bevy of aquatic-themed ideas for Song of the Deep, including some interplay between the submarine’s weapons. Shoot a torpedo and then grab it with your submarine’s claw and it’ll spin around your vessel like a murderous shield. Creative, albeit a horrific safety hazard. Upgrades are along the lines of torpedoes that encase enemies (or lava plumes) in ice, or headlights that scare away jellyfish, or glass-shattering sonar pulses. And then there’s Merryn herself, who eventually gains the ability to exit the submarine to enter narrow passageways or solve some pretty easy (and tiresome) puzzles. Despite all this, Song of the Deep still feels a bit thin. It runs out of enemies within a few hours, then resorts to recoloring them (for “new” enemies) the rest of the game. Merryn’s repertoire of abilities mostly boils down to elemental versions of torpedoes. Torpedoes you’ll barely need, I might add—combat’s fairly easy, especially if you pursue even a portion of the game’s “secrets” (shown on the map) and keep upgrading Merryn’s abilities. But mostly the game just doesn’t have a satisfying flow. The best games of the genre (in my experience) have a way of seamlessly guiding you from area to area, suddenly surprising you with “Oh, I’ve somehow gone full circle and am back where I was three hours ago” moments. You’re given opportunities to take advantage of your new abilities without it feeling forced. 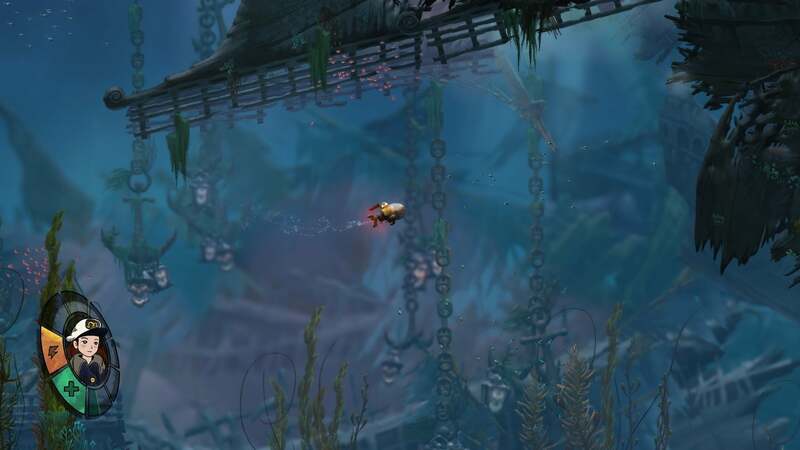 Song of the Deep ‘s progression is haphazard. The worst offenders are some sections that delve into the ol’ “Gather These Three MacGuffins” trope, sections that send you to all the cardinal points of the map to find random objects. Even at the best of times though Song of the Deep feels stilted—too big, too empty, too contrived. 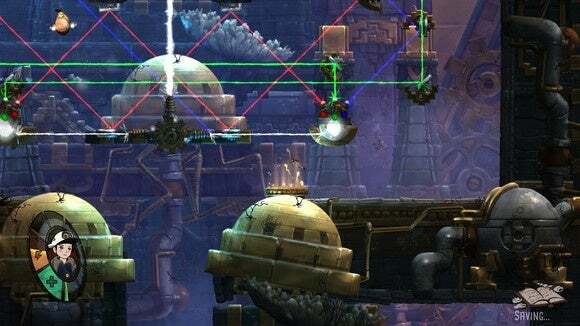 To skirt this, Insomniac’s created a fast travel solution so you only have to re-run so much of each area. That’s a stopgap though, and only helps somewhat mitigate the game’s awkward way of shuttling you as far in the opposite direction as possible at each new objective. Plus it feels like an insult to the wonderful areas Insomniac has created. The storybook art on display here is gorgeous, and fast travel renders it all moot. Okay, that’s quite a bit of negativity aimed towards Song of the Deep, I know. But I like it. I’m more disappointed that the game doesn’t reach its full potential than anything else. 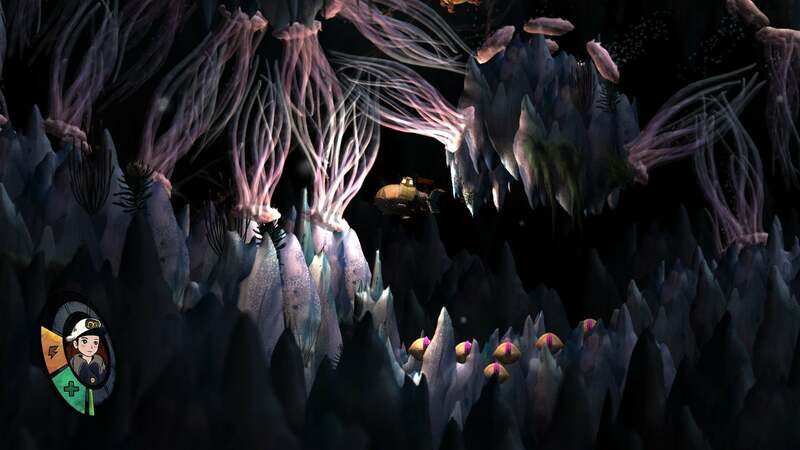 Song of the Deep feels like a solid framework for a more expansive, polished experience. The first ropy strands of muscle and ligaments have been wrapped around these old bones—a creative combat system, a beautiful (I can’t compliment it enough) setting, and a mature and self-reflective coming-of-age story. These help elevate Insomniac’s efforts above the crowd of genre-alikes. But it’s still lacking the illusive spark that would make it a must-play game. Song of the Deep is gorgeous and has some creative ideas, but lacks the polish to make it a must-play.